This is certainly an action packed novel, we jump straight into a scene where Nick is accosted by Coyote, who I know from fiction as a Native American spirit shape-shifter, and assume that Brian is using the same character. Coyote plays about with Nick, forcing him into a rescue and giving him a scale from a dragon…all very curious and that’s one of the problems I had with the book, the way everything just happens without any kind of background. I love this sort of book, where parallel worlds exist with gods and demons, spirits, vampires and shape-shifters, and a few select people with special abilities. The action was perfect, tightly written and riveting, but – and its a big but – I felt I was reading a later book in an existing series. I really struggled with all the different demons, angels, vampires and with Nick’s mysterious powers. None of it was explained and it meant I was constantly wondering how – why- when…I love this sort of fiction and Brain can clearly write it well but I just wish I understood more of the characters abilities and motivations. As it was I felt I was bumbling along finding out as the story unfolded. I don’t mean I need to know everything upfront, or be spoon fed each detail, but a bit more about Nick and the past incidents with his wife and sister in law would have made the story flow much better for me. Priced at £2.68 for 334 pages/524kb is certainly excellent value if you can work out where the story goes better than I could 🙂 maybe your mind will work differently to mine. If Brian was to write a prequel explaining the events of the past then I’m sure this book would work far better for fantasy lovers, certainly it would for me! 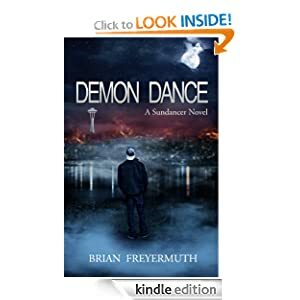 Sort of Sundancer 0.5 …..
Brian’s passion for storytelling would eventually lead to a wonderful opportunity to get back to his writing roots by joining Disney and Junction Point in 2011. During his time there, he co-wrote the story and dialog for the WGA Award Nominee Disney Epic Mickey 2: The Power of Two, where he worked with comic book writer Marv Wolfman and industry legend Warren Spector to give Oswald the Lucky Rabbit a voice at Disney for the first time in 80 years. Born in the quaint town of Manitou Spring, Colorado, where he grew up in the shadow of Pikes Peak, Brian moved to California as a teenager, eventually graduating from UC Irvine with a major in Comparative Literature and a minor in Computer Science, both of which he uses in his professional and personal careers. Brian is also a member of the Horror Writer’s Association, and loves to write and play video games in his free time. He currently lives in Atlanta with his wife, Juliet, and their son, Kyle.